Who will Gen Z be? An overview for doing business with the new kids. What Generation Comes After Millennials? Meet Gen Z. Generation Z (Gen Z) is your greatest opportunity, both as new account holders and talent for your workforce. 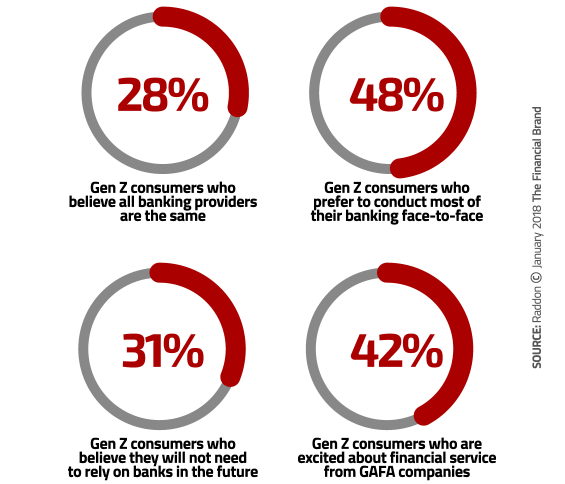 While Millennials are a crucial market for community financial institutions, the subsequent generation (Z) is taking their first steps into adulthood, and they need financial partners. Loosely defined as anyone born between 1995 and 2015, “this group makes up a quarter of the U.S. population and by 2020 will account for 40% of all consumers,” according to Fast Company. While Millennials are the largest group of consumers now, Generation Z is the future; and now is the time to begin thinking about how to best engage them. How will you serve them as consumers? How will you recruit them as employees? In this blog, we’ll touch on some of the early research and what it indicates about the mindset of Generation Z and how it may affect the future of your institution. Generally, Gen Z was born between the years 1995 and 2015, making the youngest members 3 years old and the oldest 23. As you can see from that range, lumping generational cohorts together based on a ~ 20-year birth window can lead to some unhelpful generalizations. In any given generation, the oldest and youngest members will differ greatly — but looking closer reveals some general similarities in mindset, behavior, and life experience. This blog explores some “working” observations based on current research. Use it as a springboard for your understanding of what makes Gen Z unique. Generation Z is Purposeful About the Content they Engage With. Despite the assertion that attention spans have dwindled to a goldfish proportions, Generation Z spends a lot of time on social media, and advertising on those platforms needs to be customized to fit the medium. They can sniff out canned or insincere messages in seconds — take the time to meet them and create purposeful conversations. A Great Customer Experience is Table-stakes. As native denizens of the Internet, they expect financial transactions to be almost frictionless. They will look for financial service providers who can fit into their digital lives, and think far less in terms of the “bank or credit union down the street.” When your “map” of the world is an internet-equipped smartphone, “local” has less to do with zip code, and more to do with relevance. Industrious and Looking for Stability. Gen Z Consumes with a Cause. This preference can play very well into the ethos of most community financial institutions — your commitment to the people and neighborhoods you serve is a major advantage. Look for ways to clarify your values and weave them into everything you do — including your marketing communications. Give Gen Z a reason to care about what you do and you’ll find them more than willing to engage with you, as account holders and employees.